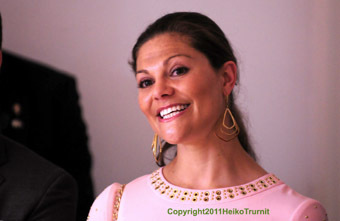 Together with her mother Her Highness Crown Princess Victoria of Sweden supports underprivileged children. That's why she came to see Buntkicktgut on the occasion of her visit to Munich. Crown Princess Victoria and her husband were very interested to see for themselves what can be done to improve through sports the integration of immigrant kids. The Princess overwhelmed everybody with her radiant charm, and the Prince showed his soccer skills by perfectly converting a penalty kick.